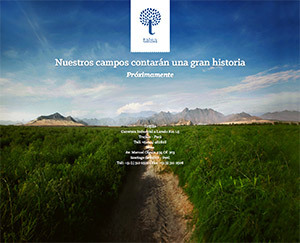 Talsa is a family owned company that was established in 1992, in the Trujillo valley. Rafael Quevedo, the founder of the company, is the one who made possible all the agriculture that now exists in this part of northern Peru. Rafael was the pioneer in the implantation of trickle irrigation in the deserts of Trujillo, when he introduced irrigation equipment to Peru. Talsa’s new exciting blueberry project, which is the result of Rafael vision, will have over 1,000 hectares of blueberries that will reach maturity during the next few years and will make Talsa and Peru one of the largest blueberry producers in the world. “We are very excited about this new venture” says CEO Ulises Quevedo. Talsa also grows White Asparagus and Hass Avocados.